Ticks are external parasites from the same family as spiders. Ticks feed on blood from hosts including small wildlife, dogs, cats and humans. Female ticks require a blood meal to complete their life cycle. One female tick lays 4000-8000 eggs! Ticks start as eggs laid in the summer, emerge as larvae in the fall, molt into nymphs in the winter and end up as adults in the spring. The infant stage of a tick can be quite small and missed even with keen observation. An adult tick is the size of a sesame seed and once it is engorged with blood can become the size of a pencil eraser. The engorged part of the tick can have variable colours. Ticks are active in temperatures over 4C. There are two “blooms” in the tick population each year, occurring in the early spring and late fall. Tick bites will be most common during these times. Tick bites are usually not painful, but cause irritation (reddening) of the skin and minor swelling. Even after the tick has been removed (or falls off), swelling and/or redness in the area of the bite can last for a few weeks. The brown dog tick is unique as it can live inside homes or dog kennels. Kennels in Toronto have reported infestations. Deer ticks infected with Lyme bacteria are well documented throughout southern Ontario. Deer ticks are found in wooded areas, along the side of trails, playgrounds and grassy areas in urban areas. Deer tick populations are expanding and it is possible that Lyme disease can be acquired outside the currently identified areas. 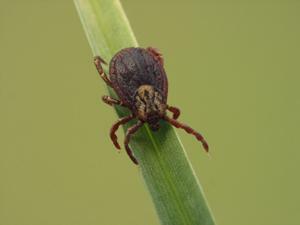 A deer tick bites a human or dog and transmits Lyme bacteria (Borrelia burgdorferi) through its saliva. Lyme positive dogs may be asymptomatic, but a subset can become ill and require treatment. In early stages (4-6 weeks after a bite) symptoms can include fever, decreased energy, swollen lymph nodes, decrease of appetite and limping. The treatment for dogs that get sick is a course of antibiotics. In certain dogs (if left untreated) the immune system is constantly active, creating antibodies, which can lead to irreversible kidney damage. Symptoms of Lyme disease in a person are different from those in dogs. It is best to prevent tick bites through avoidance or removing ticks right away before they have time to transmit disease. You can keep your pet on a trimmed lawn and on-leash when in the woods. It is recommended to look for ticks by combing through your pet’s fur when it comes back from playing in wooded areas or areas with long grass. A tick can be removed at home with tweezers or by a technician at our clinic. There are several topical veterinary products that kill and repel ticks. For dogs traveling to a high risk region for Lyme, vaccinating dogs is also an option. 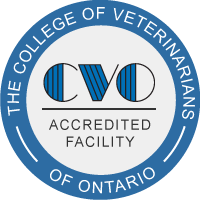 Coventry Animal Hospital recommends yearly heartworm and Lyme testing to screen for exposure to infected mosquitoes and infected deer ticks respectively. Tick prevention is safe to use even in the event that a dog is Lyme positive.